You’re swimming in the pool lane and it’s going pretty much as it usually goes. Outside the lane the rest of the pool is public recreational swimming. In the other part of the pool are a bunch of lads, maybe in their twenties. At one point you flip off the wall mid-way through a 400 or an 800 repeat set. 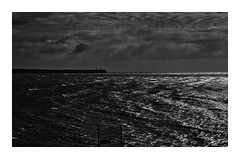 Half way down the length you realise that one of those lads is thrashing through the water, arms and legs flailing, head bobbing, white water and bubbles everywhere. The guy is racing, and he’s racing you. You continue at your own pace, (because you have nothing to prove in this situation) and you both touch the far wall around the same time. The guy pops up, probably with a smirk on his face because he’s just proven to himself, and all his mates, and you, that he’s as fast as you, and he doesn’t even swim and doesn’t need to flip turn! You don’t see the grin, because you’ve flipped again and continued on your way. You forget the individual incident because similar have happened over and over previously. Another day you’ve finished your 5000 metre session and you are in the sauna or dressing room when someone else says to you “oh you’re a great swimmer“. You feel embarrassed because you actually know some great swimmers, and you know you don’t compare to them. You know what a good swimmer is, and it’s certainly not you. These are both illustrations of the Dunning-Kruger effect and I am of course giving examples from personal experience. The Dunning-Kruger Effect is the resulting name of studies by psychologists David Dunning and Justin Kruger of Cornell University and published in 1999. It means, as the paper says, that “people tend to hold overly favorable views of their abilities in many social and intellectual domains“. The study says that incompetent people suffer dual difficulties: Their incompetence means that they “reach erroneous conclusions and make unfortunate choices” and that same lack of competence stops those people from having the cognitive ability to realise those deficits. The original paper related to intellectual and social aspects but seems to extrapolate to many aspects of skill or knowledge. So people with less skill can’t recognise their own lack of skill and over-estimate their ability. Incompetence doesn’t recognise its own incompetence, it creates its own blind spot. Of course this explains only the first anecdote above. The contrasting discovery of the paper is that as those same incompetent people increase in skill level, they develop the ability to analyse their own skills and actually see the deficits and limitations in those same skills. The more you learn and the better you get, the more incompetent you often feel. You may recognise the Dunning-Kruger Effect in another form, the so-called Four Stages of Learning: Unconscious Incompetence, Conscious Incompetence, Conscious Competence and Unconscious Competence. Stage one is obvious in comparison and the other three stages seem to be compressed into the alternative aspect of the Dunning Kruger Effect. I really only recognised this effect as something beyond my own insecurities from reading about photography. It’s a known symptom amongst photographers that early on in skill development they are certain they are doing something interesting and shooting good images. Then when they learn a bit more, any confidence evaporates and they become convinced they more producing mostly or all rubbish work. The best example I can give for this is that for every new photograph I upload to Flickr, I usually remove at least two which now seem too poor to be seen. I also wait at least a day and often a week before I upload something, just to be sure. I have over the last year reduced the size of my Flickr account by 75% and that process still continues. This isn’t false modesty, it’s the Dunning Kruger Effect. Empirically, the evidence would suggest that I am a reasonable swimmer… This last sentence made me laugh when I reached the end, when I realised I was unable to write “good“. Empirically the evidence would suggest that I am a good swimmer…but I don’t feel more than average. Part of this is social conditioning, part is national (Irish) character which decries any self-aggrandizement. Even against my will and disagreeing intellectually with it, speed is still often the only criteria for many swimmers. SwimSmooth is a good example of this where Paul Newsome regularly specifically describes good swimmers according only to a speed criteria. But if I see myself swimming on video, I’m horrified. Or I see my race results and know I will never be good. I am (seemingly permanently) at what is illustrated below as the humility threshold. (Yes, I know you wouldn’t think it from all the writing here, but the evidence is all about the site when you recognise it). There are also societal effects. This is often recognised here in Ireland, as I’ve previously mentioned that Irish society denigrates any self-promotion, and like the Australian “tall poppy” syndrome, we have the phrase “Irish begrudgery” to describe how we Irish typically and negatively react to anyone who has done well. Let’s go back to the first vignette above. Another facet is that “racing guy” doesn’t know enough, not only to be unable to evaluate his own skill, but he can’t evaluate mine (or anyone else’s either). If you are an adult onset swimmer you will likely recall that before you began, swimming was just swimming and you couldn’t visualise any difference. You didn’t or couldn’t grade what you saw. Sure there were those people you saw on TV at the Olympics. But you never noticed anything specific when you saw anyone else swimming. Conversely while I may lack confidence in my own ability, I still retain the ability to objectively evaluate someone else. The strengths of the different aspects don’t seem to matched. My conviction that I don’t know what I am doing is not as strong as the incompetent swimmer who is certain that they do know what they are doing. As my predictably favourite poet said in one of his most famous poems, “The best lack all conviction, while the worst are full of passionate intensity”. I don’t mean I’m one of the best. Dammit! I’m patently not a psychologist. But I’m describing a psychological facet based on a few articles. I don’t know enough about psychology to be intimidated at so doing. The Dunning Kruger Effect. I started a blog about open water swimming. I had just enough knowledge at the time to think I’d do it for maybe a year. Over four years later here we still are. The Dunning Kruger Effect. You’re certain [Global Warming] isn’t real because of a few articles you read and that one radio presenter you heard and the fact that “it doesn’t make sense“? The Dunning Kruger Effect. You can substitute a whole host of terms here, from Homeopathy to Quantum Mechanics to Creationism, the JFK Assassination, Area 51, WMD etc etc. Someone who has never swum the English Channel thinking it’s the same as swimming in a pool, just for longer? The Dunning Kruger Effect. Swimming is a difficult and technical sport, far more so that those who don’t participate in it recognise. Now on top of that is the realisation that we ourselves, in most cases, are more negative about our improvements than is warranted. We should all remember to look, not at where we think we should be, but at how far we may have come. 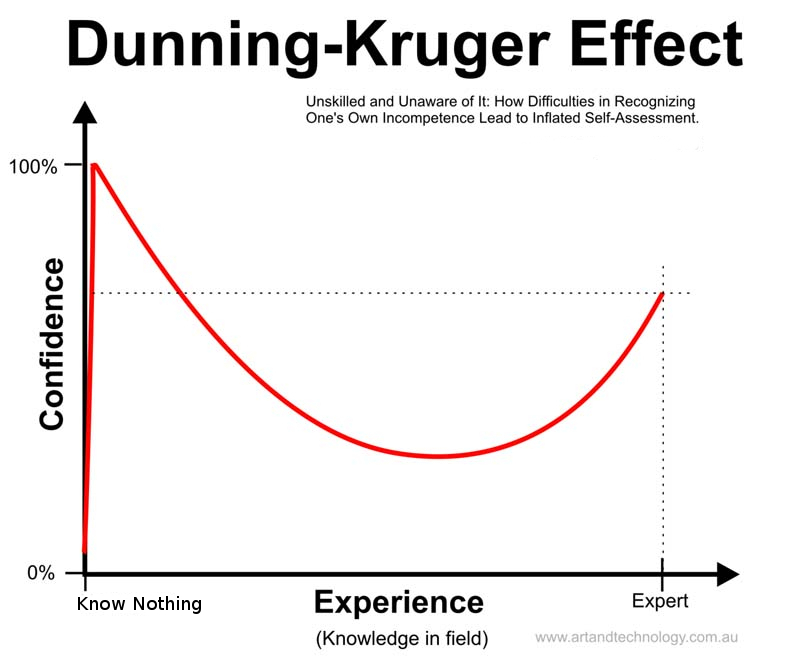 While the Dunning Kruger Effect is an interesting way at looking at swimming or skills development more generally, it’s also useful to remember with respect to open water swimming beginners. The aforementioned pool anecdote doesn’t result in any injuries, but someone with the same level of over-confidence stands a higher chance of injury or death in open water, especially when we consider that analysis of open water drownings and see that alcohol is implicated. A combination of both alcohol and an inability to judge personal ability is a deadly duo in open water and once again means that those of us with more skill and experience should always be on the look-out when there are beginners around. Rather than leave you with an entirely negative impression we should remember that the Dunning Kruger Effect is an aspect of the continuous improvement process and the development of our judgement and knowledge. It doesn’t dictate anything about skills development or the learning process, it merely explains why sometimes we may have been over confident and why sometimes we are still under-confident. It’s neither a guide nor a barrier to becoming a better swimmer, but there is interest in understanding particularly why we think certain ways about our skills. FLOW, the ideal swimming state, also based on another psychological publication, which could be interpreted as Stage Four on the learning stages above, on those days where, (regardless of your speed), you enter that transcendent state where everything goes, well, swimmingly. And an article I wrote as a reminder to myself and which I hope you will remember better than I: Perfect is the Enemy of Good. if you are already a swimmer, you’re probably better than you realise. This is deep stuff, Donal. Lots of food for thought. I certainly found it interesting Jean, if the site are are anything to go by, so did a lot of others. As Sam said above – you can be incompetent and know that you are. So there are other psychological effects at play. As an analogy – I used to think that people could make me angry; now I appreciate that I am angry because I have chosen to be, and I can respond differently. And thus I am able to apply this cognitive competence to those situations where I am still incompetent and take comfort in the process of change or development. I can take a meta position, so to speak. There is also the perspective of your relative position – to the aforementioned pool swimmer you are ‘great’, to those you know are ‘better’ than you, your own take is that you are modest/good etc – but they themselves may think of you as great. And then there is the perspective of how ‘great’ is considered. I sometimes think that the swimmer who decides to do a marathon swim and applies themselves to the mental and physical training required and then completes their first very long swim is, perhaps, greater than the swimmer who has completed many marathon swims…which relatively are no longer such a challenge. But given the other variables in play, I am also aware that this is shaky ground I am on. Thanks for provoking my thoughts. Just wasn’t careful checking online graphic sources. Fixed now, cheers. Very good question, I’ll give it some consideration and hopefully turn it into a blog post! On a side note I missed both the Perfect is the Enemy of Good and the Flow Ideal Swimming State posts – both very interesting and reminded me of last nights training in the pool. I was moving in and out of focusing on technique and being frustrated before eventually falling into a kind of rhythmic hypoxic session where I more so focused on breath control which I find only really works if you let everything else go and just GO. This feels like an appropriate place to share the following quotes.